This site, online since 1995, celebrates one of the most wonderful creatures in the world: the domestic cat. Here in our Library, you'll find tons of cat humor, cat care and behavior information, facts, trivia, stories, heroic cats, amazing cats, fables, fairy tales, and much much more. Visit the rest of CatStuff for more. Great idea!! 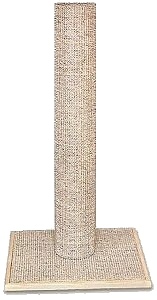 The best scratching post is made of rough sisal mesh fabric and is tall enough for the cat to really stretch out. It needs to be sturdy and stable, and should not wobble or slide across the floor. Most scratching posts at pet stores are not tall enough for a cat to stretch. Read more about scratching posts in this article. We've been using scratching posts from TopCat Sisal Products for many years, and our cats couldn't be happier. A good scratching post is a purchase your cat -- and your couch -- will definitely appreciate. Are you looking for really cool cat stuff? Check out my Shopping Ideas. Do you read books about cats? Love mysteries with cats? See my recommendations here. Does Your Cat Come When You Call? How Well Does Your Cat Know You? The Cats are NOT Pampered! Things I, the Cat, Must Try to Remember! Top Ten Signs That You Are A "Crazy Cat Lady"
Are you prepared for a disaster or emergency? How Does a Cat Purr? Records: The Biggest, Smallest, etc. Why Has My Cat Stopped Using the Litterbox?? Which Cat Should You Pick?